What’s a Good Conversion Rate for Ecommerce? We often talk about how our team makes ecommerce websites that are meant to drive sales. What does that even look like? Will an Aeolidia website alone transform your business? What’s a good conversion rate for ecommerce? And what do you do if you feel like your website is pretty good, but you still have a low conversion rate? What is a conversion rate in ecommerce? First, an explanation of what conversion rate is: if you get 100 visits to your site (look for “Sessions” in Google Analytics), and 2 of them convert into customers by checking out, you have a 2% conversion rate. The average conversion rate across all ecommerce sites is about 1-3%. The average conversion rate for all our sites after launch is 1.97%. The best conversion rate I have ever seen on one of our client’s sites was an absolutely stunning 12%. At 12% instead of 2%, you’re now getting 6 times the sales and making 6 times the money. Wouldn’t that be amazing? Here’s the thing, though. You aren’t going to get a 12% conversion rate. Do you know why this particular business did? It was because their website was basically a secret when we launched it. Most of their traffic was loyal customers who bought from them at the farmers’ market, and came to their site on purpose to re-order. The only way for them to keep this miraculous conversion rate would be to not promote their business to anyone but their most loyal customers, which obviously is not going to grow their business. Instead, the smart thing to do is increase traffic. This causes the conversion rate to drop WAY down and sales to go WAY up, which is how it should be. Your conversion rate is not just a single number. All of these different traffic streams will have different conversion rates. If, for instance, you see that your desktop traffic converts at 3% and people on a phone convert at 0.5%, it may be time to improve how your site works on mobile (or maybe you’ve just been sending a terrible mobile traffic stream to your site, and the site itself is fine). If Instagram traffic converts at 1% and Facebook traffic converts at 5%, it might be time to up your Facebook game and spend less time on Instagram. If men buy your product like crazy, but you’ve been talking to women, it may be time to be more inclusive. Conversion rate only matters for qualified traffic. Sometimes during our initial Google Analytics stats analysis, our clients may see that they’re getting a ton of traffic, but the conversion rate is pretty low. In some cases, this is because they are getting plenty of the wrong kind of traffic. Let’s say that you’re an artisanal soap-maker, and you use many locally sourced ingredients in your products, including egg yolks from your own pet chickens. Maybe you’ve written a really informative blog post about how to raise chickens in your backyard, and it gets a lot of traffic from people who want to raise their own chickens, but that traffic might not necessarily turn into more sales for your homemade cold process egg soap. All that traffic to your backyard chickens blog post will drive the overall perceived conversion rate down but it doesn’t matter. The traffic to that one blog post has nothing to do with how your site performs for your target customer, it just lowers the average. How can you improve your ecommerce conversion rate? You can’t always change one thing and expect it to dramatically improve your conversion rate. You may get lucky – maybe your shipping costs were the only thing stopping people from purchasing, and a change to the pricing there is all you need to improve your sales. But more often, it’s going to be multiple optimizations that improve your sales. Conversion rate is an important thing to be aware of, but your main focus should be on actual income, the dollar amount your website makes you. Remember: conversion rate is an indicator of where you can make improvements, but the sales numbers themselves are how you gauge the health of your business. Did you know that the problem might be your product itself? Some businesses will naturally have a lower conversion rate than others. For example, products with high price points, that are hard to ship, or that take work on the customer’s end (customization) can’t expect as high conversion rates as an impulse buy type product. If you offer customizable products, sometimes offering your customers fewer options can be a great way to increase sales. This case study with one of our jewelry designer clients explains why. So, what kind of conversion rate can you expect? How much your conversion rate increases after the launch of a custom Shopify website depends on many factors, including the amount of work you as the shop owner are willing to put in. On average, a 27% increase in conversion rate is pretty realistic for most of our clients to expect, though many of our clients have seen conversion rates increased by nearly 88%. When I’ve seen significant growth for our clients, it is due to ALL the benefits of having a great brand and strategic website: their conversion rate is higher, their marketing becomes more effective, which increases traffic, and they are able to use these advantages to increase their sales on their site and on other sales channels as well (for example, growing a wholesale business boosted by the strength and success of their new brand). Growing your business is really freakin’ hard work and it’s not going to happen overnight or be caused by one choice you make. It’s a combination of many decisions, risks, investments, failures, learning experiences, and most of all: ELBOW GREASE, my friends! All of the most successful businesses I’ve worked with over the years have had a determined, adventurous go-getter at the helm. It’s my very true pleasure and honor to work with these unstoppable forces, and I hope to speak with you soon if you’re ready to step boldly into your business’ future with me. Would you like me to go over your numbers and what you can expect? Even if we don’t end up working together, it can help get you pointed in the right direction, and it’s fun for me to think through. Request our rate sheet, and I’ll send you a few quick questions about how many visitors and sales you get. Learn what you can do as a shop owner to drive more traffic to your website and make more sales. 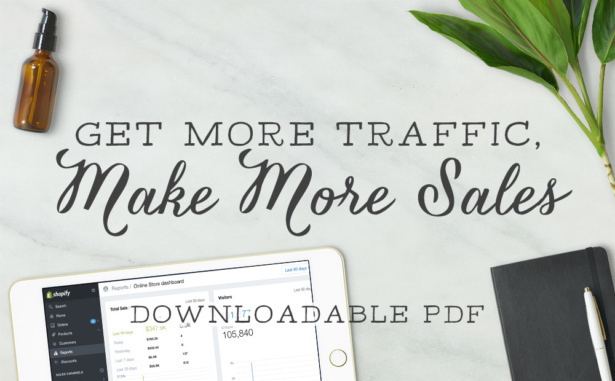 Your guide to getting more traffic and sales is on its way! Arianne is a popular educator and small business enthusiast, and has collaborated with Craftcation, Mailchimp, CreativeLive, The National Stationery Show, Design*Sponge, Brick House Branding, Flourish & Thrive, and Altitude Summit, among others. She is raising boys, will walk any distance, always has a pile of novels by her bed, is learning to sew her own clothing, and was once bitten by an elephant seal.